Another rediscovering Jesus book? 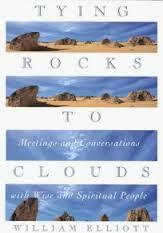 Just when we thought there was nothing left to rediscover, spiritual pilgrim and psychotherapist Elliott (Tying Rocks to Clouds) offers this original, challenging and affecting investigation of the real Jesus. Seeking the answer to one simple question (what does Jesus mean in people’ s lives? ), Elliott travels the country in a motor home, interviewing believers. His finished product is an engaging blend of reportage and memoir. Readers will meet a diverse cast, including evangelist Josh McDowell, New Testament scholar Luke Timothy Johnson and theologian J.I. Packer. With representatives from every corner of Christendom, this book is capacious. Evangelicals tell Elliott that Jesus was without sin, died on the cross and had a bodily resurrection, while liberals such as Episcopal Bishop John Shelby Spong insist that Jesus was married to Mary Magdalene and interpret the resurrection and virgin birth metaphorically. Moreover, the interlocutors aren’ t just Christians. Some of the most fascinating discussions of Jesus emerge when Elliott sits at the feet of Rabbi Zalman Schachter-Shalomi (who suggests that the Messiah will not be one individual, but rather that we all will become Messiah ) and New Age guru Deepak Chopra. In between the interviews, we gain insight into Elliott’ s own spiritual life. Readers won’ t find tidy answers about Jesus here. What they will find is a heartfelt love poem to a Jewish carpenter from Palestine who had something profound to teach about love itself. (Sept. 17) Copyright 2002 Cahners Business Information. In early June of 2002, I left the United States and traveled to the locus of my own soul. If one were to look at a map, they would say that my destination was Israel (specifically the Judean Desert) and that I had traveled 6,497 miles. But in actuality, I traveled much farther than that-upon a road whose traversing is not measured in miles, but by the deepening of the human experience, love and acceptance; and not by direction (for there is only one direction-inward). And whose perilous mountains, cliffs, and valleys were not composed of stone or sand, but of one’s own psyche (the most dangerous of the world’s creations). In Bill Elliott’s forty days in the Judean desert he learns many deep and poignant truths about himself, his world, and his relationship with God. He reflects back on significant (and insignificant) moments in his life and learns from them as well-his parents dying at his home when he was 12, a dream he had about TV psychiatrist Frasier, the comical relationship with his best friend Dave who later committed suicide, and other incidents. This book is truly in the vein of the introspective works of Anne Lamott, Don Miller, and others. If you’re looking for a deeper spiritual experience, you will devour this book.